The annihilation of a family by one of its own members, which is often entailed in murder-suicides, seems to defy every basic survival instinct we have. Perhaps this is why our response can be hopelessly banal – ‘The most normal person you could meet’, was a neighbour’s description of school vice-principal Alan Hawe, who in 2016 in County Cavan, Ireland, stabbed to death his wife Clodagh and his three young boys – (Liam, 13; Niall, 11; Ryan, 6) – before killing himself. 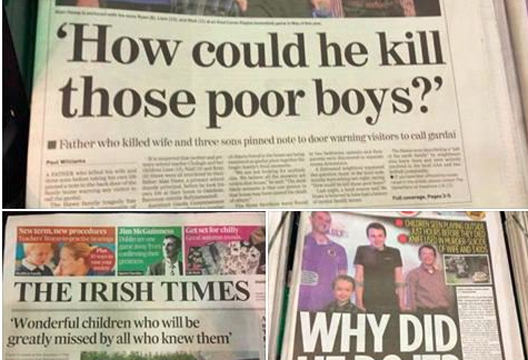 The many testimonials in the media by friends and neighbours led some to feel his murdered wife was completely overlooked, sparking a trending hashtag #HerNameWasClodagh. Ultimately an inquest heard that Clodagh’s husband had suffered depression for about a decade. He had said he wanted to kill himself for a long time, but he didn’t want Clodagh and the boys to have to live with the shame of it – he felt they’d never survive without him. The Hawe murders were ultimately recorded as ‘unlawful killings’, and the suicide was recorded as such. Astonishingly, it is relatively recent that the incidence of murder-suicide has begun to be recorded, and much of the extant research is based on media reports. The need for a comprehensive national database and tracking system for this ‘shockingly common’ phenomenon has been recently noted (11 per week reported in the US; Violence Control Policy, USA, 2018). Accurate and reliable data are essential, given that M-S is thought to be a distinct phenomenon, different from both homicide and suicide. The majority of perpetrators of M-S are male (>90 per cent), and victims are most commonly a female intimate partner, girlfriend, wife, past or present. Of course the vast majority of males do not commit murder-suicide, and so we need to understand the context, psychological dynamics and precursors involved for a subset of males who commit intimate murder-suicide. It has been suggested that the masculine ideal that promotes toughness, stoicism, aggression, and dominance, can lead to male violence. When this type of masculinity is threatened by loss of power, violence may be seen as a means of taking back control – in situations of threatened estrangement from an intimate partner, or if respect from peers is withheld at work or at school. Recent American Psychological Association guidelines for men and boys recommend exposure to positive masculine ideals at an early age to help change the psychology of masculinity. Do readers agree? Or do they feel that the new guidelines pathologise maleness? Other precursors of familial murder-suicide may be financial worries, work pressures or job loss. Jealousy and vengefulness are frequent motivations in intimate partner murder-suicide, and vengefulness against perceived peer injustice is frequently reported as a motive in mass-murder-suicides in workplace and school situations. Male perpetrators are routinely described in media as ‘lone wolf’ types, and emotional isolation may be part of the reason that relationship estrangement – unfortunately, even after many years – is a factor in intimate partner M-S. Women leaving an abusive relation are at increased risk during the transition period – what can psychology do to help women in these situations? A history of depression is also relevant in intimate partner M-S. Depression in older males in a caring role is thought a risk factor – one study with older males showed 65 per cent were depressed, but post-mortem indications were that anti-depressants were not taken. The masculine ideal of self-reliance may be behind male reluctance to engage with treatment, where it is felt as a sign of weakness to seek help. Campaigns such as National Institute of Mental Health’s ‘Real Men. Real Depression’ may promote changing attitudes. Has the stigma related to depression been reduced since more people are opening up about depression in popular media? Or has the discussion tended to swerve the issue of severe recurrent depression? Andrew Solomon, who wrote about the Columbine mass-murder-suicide, said that the more he delved into the information the less he understood the phenomenon. Do psychologists feel this way too? Are we up to the challenges posed – can we truly aspire to prevent, reduce rates via intervention, or provide solace in the aftermath? Is there more that psychologists can do to effectively intervene earlier, for example in family conflict?